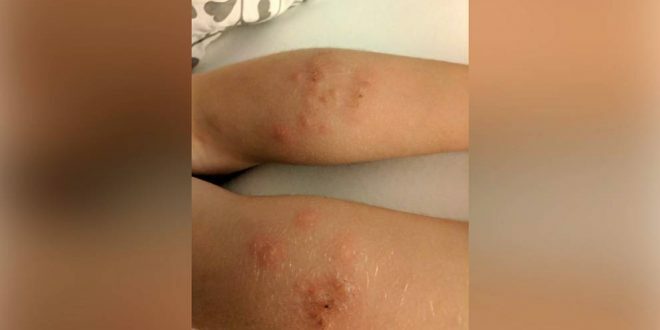 A mother and daughter had a nightmare of a flight when they were bitten by stowaway bedbugs on their trip. “She was like, ‘Oh ok, sorry about that. We’re sold out. We don’t have anywhere to move you’,” Szilagyi said she was told. “It was nine hours of knowing that I was probably going to get bit, but not being sure. But there wasn’t really anything I could do about it. “I was surprised I was able to relax, but what can you do?”, she told CTV. Szilagyi who was travelling with her fiance and her seven-year-old daughter woke up “absolutely covered” in bites. “Me and my daughter are both really sensitive to insect bites, so she was just covered just all over. I’ve still got a really infected one,” Szilagyi said. BA upgraded the family to business class for the return flight and offered an apology. “We have been in touch with our customer to apologise and investigate further. British Airways operates more than 280,000 flights every year, and reports of bed bugs on board are extremely rare. Nevertheless, we are vigilant and continually monitor our aircraft,” the airline said in a statement.